Still searching for some great Thanksgiving dinner sides? Or desserts? This one could easily go both ways. Or…in my case, it happened to be lunch. This recipe has a few steps involved but is really still pretty easy and oh so tasty. The creamy, slightly sweet filling paired with the crunchy topping is just perfect! 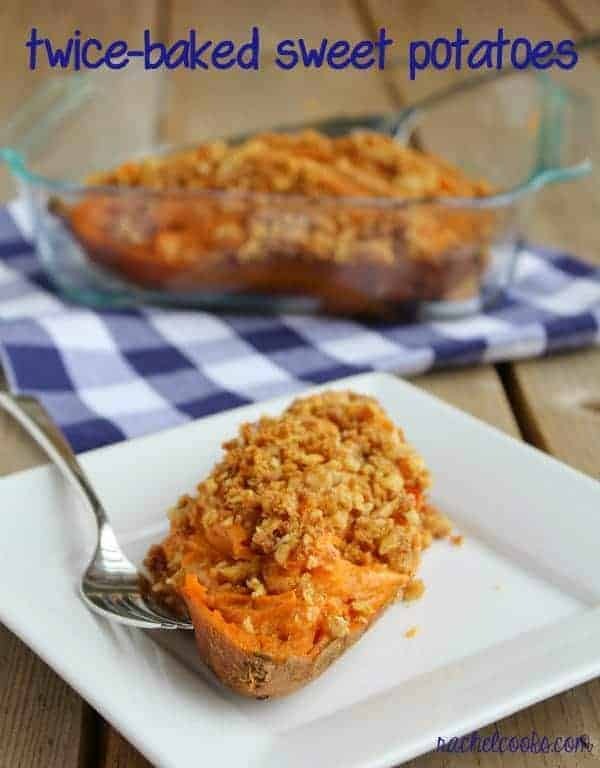 Twice baked sweet potatoes have a sweet and creamy filling with a crunchy topping. Preheat oven to 375 degrees F. Wash sweet potatoes and prick all over with a fork. 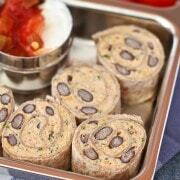 Wrap in foil and bake for 1 to 1 1/2 hours or until tender when pierced by a fork. When cool enough to handle, cut potatoes in half and hollow out all but ~1/4 inch border of the sweet potato flesh. Discard one skin. Place remaining three skins in a baking dish that has been sprayed with non-stick spray. 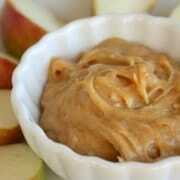 Add the flesh to a food processor with 1 tablespoon butter, cream cheese, 1 teaspoon cinnamon, nutmeg, and 2 tablespoons brown sugar. Process until smooth. Spoon into the sweet potato skins. In a small bowl, combine topping ingredients with a fork until everything is incorporated with the butter. Spoon over sweet potatoes, lightly patting down to adhere. Bake until topping is golden brown, about 10 minutes. I made a small batch of these because there were only 2 and a half of us eating them. Just multiply all the ingredients to serve a bigger crowd! Verdict: Delicious! Loved these for lunch, loved them as a side dish–although I can’t remember what I served them with. Hellllllo pregnant brain! Husband’s take: He liked these a lot too! And I think he was quite skeptical at first. E also inhaled them (I scooped the filling and topping out and gave it to her minus the skin). Difficulty: Like I mentioned, a little work, but not difficulty. Wow, these looks amazing! I love sweet potatoes! Oh, I love sweet potatoes! This is a great way to serve them! oooo I am lovin this idea to do with sweet potatoes…and it happens to be the dish assigned to us to bring!!! thanks for sharing. io’m totally and completely in love with twice baked potatoes and twice baked SWEET potatoes just sounds off the charts Rachel! I can’t believe i missed these the other day – i’m pinning… saving them to make around christmas for my family! These look great Rachel. I love sweet potatoes and this just puts them over the top! These look amazing. 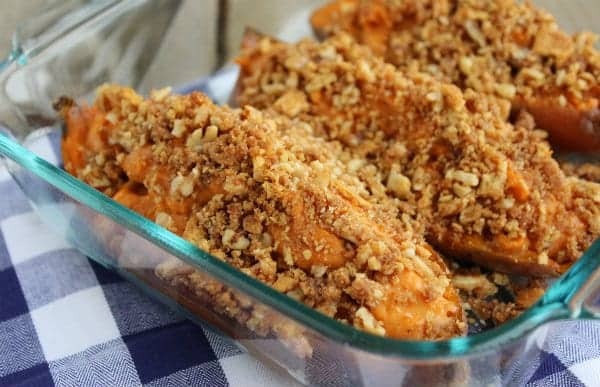 I’ve been craving sweet potatoes, have never tried them like this! I have become a huge sweet potato fanatic, minus the marshmallows! I love these twice baked and that crunchy topping, oh yeah! I posted a sweet potato recipe today too, we’re on the same wavelength :) Yours look awesome, I just love the topping! 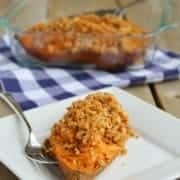 Such a great way to eat sweet potatoes and I love the idea of that topping! Love your recipes.How can I print them out? Eeek—a print button is on my mile-long to-do list, Maryann. Right now, you can just copy and paste the text into a document and print that way. 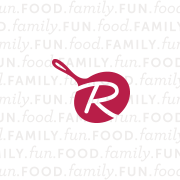 If you’re having any trouble, let me know and I’d be happy to email you the recipe text for a recipe so you can print it off from your email account. Thanks, and sorry about that!! OOoooooo-weeeee! These look amazingly creamy! Sounds perfect for Thanksgiving. They actually sound so good they could pass as dessert! Drooling. Totally agree that this would make a great Thanksgiving side, but is it wrong that I actually want them all to myself? Not wrong at all! ;) I had one for lunch the other day! SO in lust with these. Lovely Tatters Rachel and happy Virtual Shower Day!!! HUGS! Love this idea, but in my mad little brain I’d also top with a Sriracha sour cream. Or just a bit of Sriracha into the sweet potato mixture. I love the combo of heat and sweet. Ooh – the topping on these looks incredible! Thank you! It was my favorite part! Ah…the addition of cream cheese had me! These look great! I love this recipe! The crunchy topping is calling my name!